PLAYERS in the property investment sales market have just been offered two properties – an industrial plot at Kaki Bukit Avenue 4, made available for application through the government’s reserve list, and Boon Building, a six-storey commercial property at 61 South Bridge Road. The Kaki Bukit site is 323,133 sq ft and has a 2.5 plot ratio, which means the maximum gross floor area works out to a whopping 807,833 sq ft. It is zoned Business 2 – suitable for a range of uses such as clean/light industry, general industry and warehousing – and offered with a 60-year lease. Under the reserve list system, the site will be launched for tender by the state only if a developer makes an application with a minimum bid price acceptable to the government. Colliers International director (industrial) Tan Boon Leong reckons top bids for the plot – assuming a tender takes place now – could come in at $70-80 per sq ft per plot ratio (psf ppr). This works out to a land cost of about $56.5 million to $64.6 million. According to Mr Tan, the plot is in a lesser location than an earlier plot in Kaki Bukit Road 2 that was sold in August this year after attracting a total 18 bids. ‘The latest plot is farther away from the main mature industrial estate in the Kaki Bukit/Eunos area,’ he said. The earlier plot was awarded to KNG Development for $12.1 million or about $105 psf per plot ratio. It is about 1.07 hectares with a 1.0 plot ratio and is also zoned for Business 2 use, but came with a 30-year lease. The latest plot, in Kaki Bukit Ave 4, is likely to appeal to developers, who may then build landed terrace factories to sell to end-user industrialists, as well as flatted factories, Mr Tan suggests. In October last year, Sim Lian clinched a 1.15-ha, 60-year leasehold site in Ubi Ave 4 for Business 1 use for $26.3 million or $85.05 psf ppr. It has a 2.5 plot ratio. 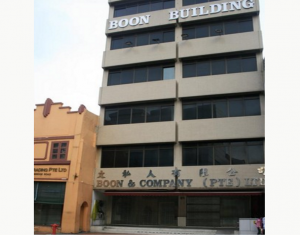 Boon Building, a 999-year leasehold property, is being sold by Raffles Point Holdings, controlled by property investor Kishore Buxani and his family. The indicative guide price is $12-13 million, which works out to $1,165 to $1,262 psf based on the estimated net lettable area of 10,299 sq ft. According to caveats records, the property was last transacted for about $9.5 million in August 2007. It will be sold with vacant possession and is being marketed by DTZ through a tender exercise that closes on Dec 17. Mr Buxani and his partners also own 108 Robinson Road and six floors of Samsung Hub.